A Furry High Five | Half Heart. Whole Life. 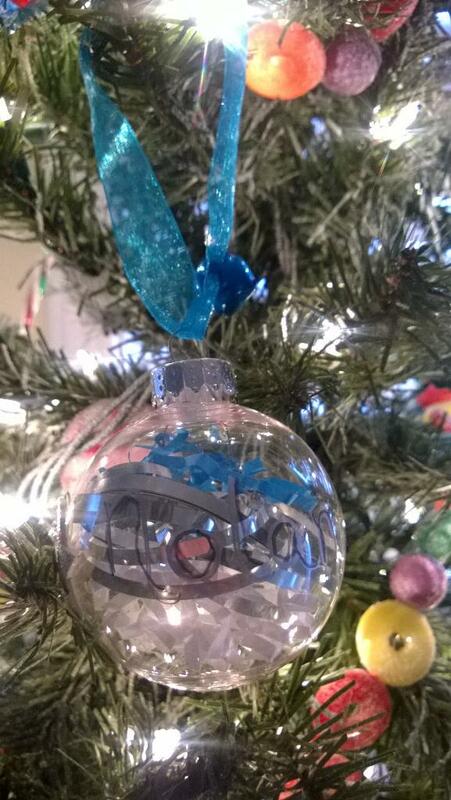 I’m always looking for fun stuff to do with the kids, especially if it’s free. If it’s free, then it’s for me! Mostly, though, I want my rugrats to have a good time and make memories in the process. 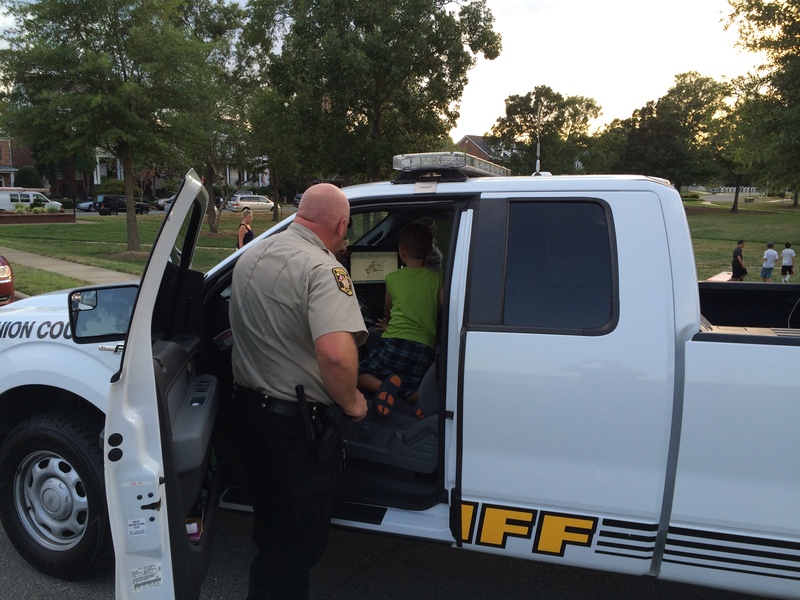 Around this time of year, a neighborhood near ours usually holds an event called National Night Out, which is to promote crime prevention and safety in neighborhoods across the country. 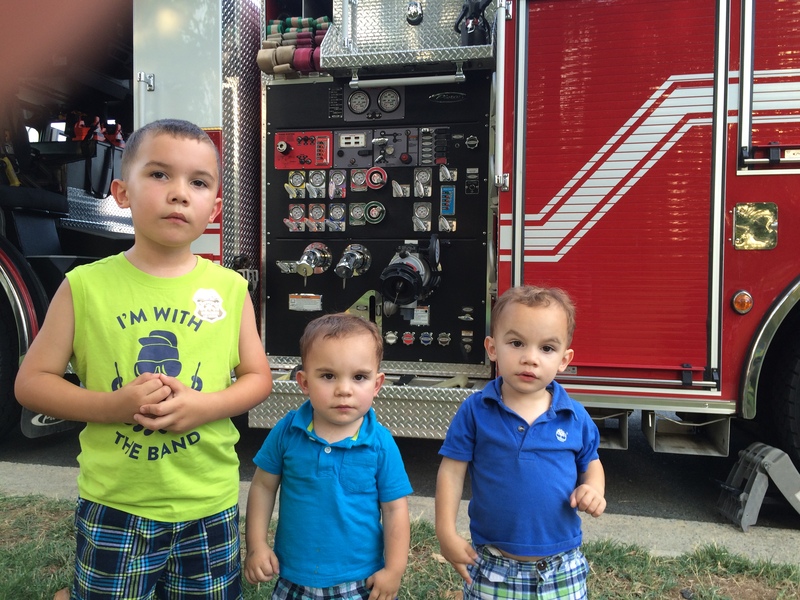 Of course it also has all the stuff 3 little boys would be crazy about: police cars and fire trucks! Hudson was scoping out the laptop. Just look at those 3 hoodlums. I’m surprised they didn’t get locked up that night. It was a lot of fun. McGruff the Crime Dog was there, they gave away lots of goodies, there was free pizza, and even a police dog demonstration. The boys were having a lot of fun, even though it was like 139072390741907120 degrees outside. Just as I was getting ready to leave with them, my oldest said, “Dad, look!” and I looked over and saw him pointing at our very own Carolina Panthers’ mascot, Sir Purr. But I will also remember seeing Sir Purr there, and how he ran around the room loving on kids, making them smile, and hearing all the laughter. I saw him entertained little kids in wheelchairs and a little girl without any hair left on her head. And for the brief time we were in that room my spirits were lifted by watching Sir Purr in all his glory. It also reminded me that there will always be a great deal of kindness in this world, and that putting a smile on one person’s face can also put a smile on other peoples’ faces too. Wow. This was SO cool! It was like one moment I’m remembering 2 years ago, as Nolan was laying in a bed – chest open, fighting – and watching Sir Purr make kids smile…and here I am…later…watching Sir Purr make my Nolan smile. We’ve come a long way! I’m sure Sir Purr meets tons and tons of kids, but I hope Sir Purr and the team know just how impactful he is when he goes out in to the community. 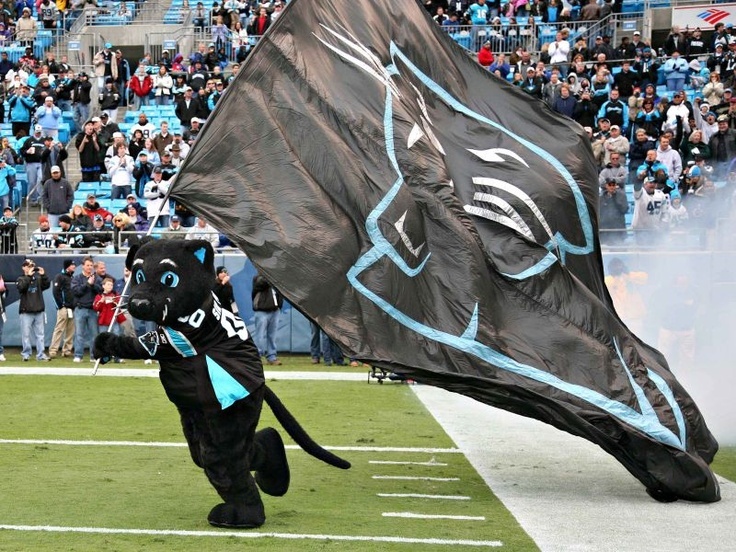 Thanks, Sir Purr! 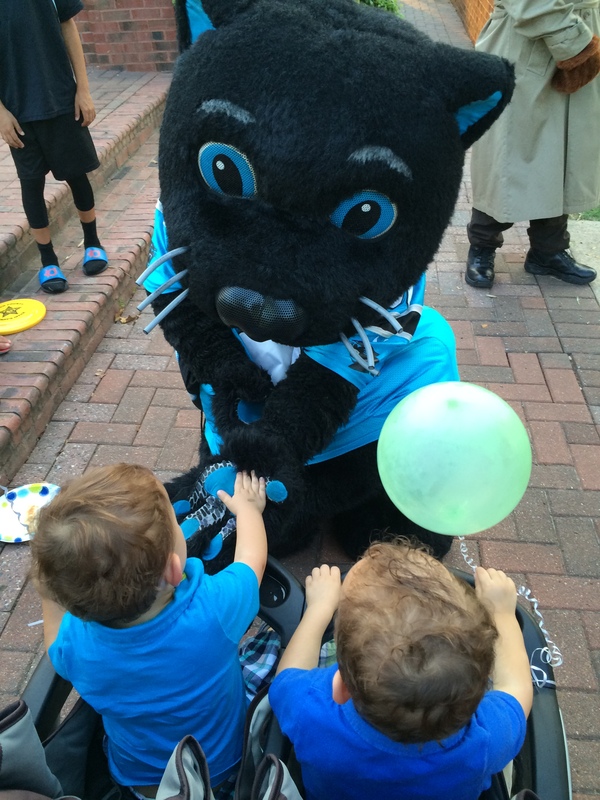 Posted on August 11, 2015, in family and tagged Carolina Panthers, CHD, congenital heart defect, HLHS, hypoplastic left heart syndrome, National Night Out, Sir Purr. Bookmark the permalink. Leave a comment.